The sun was out today on this rather nice October afternoon, so I thought I should visit a song that was supposed to be posted months ago. 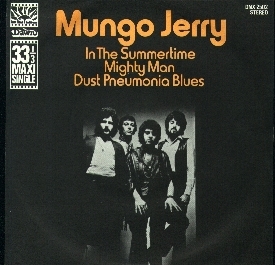 In 1970, British pop / blues / skiffle band Mungo Jerry released their début single, “In the Summertime” – a song celebrating the care free days of summer. Admittedly, while it is indeed a very good song (and one of the biggest sellers of all time), the lyrics and style have really not stood the test of time. It is also noteworthy that for all the joy and happiness of the song, the video is filmed on a rather grim road side spot, surrounded by the concrete hell that are tower blocks – a vision perhaps of the economic hell that the 1970’s became once the summer fell away. Twinned with the half-smile / grimace by lead singer Ray Dorset, as well as some incredibly dodgy shots of bassist John Godfrey and you have a slightly odd example of a very early music video with little or no direction whatsoever. Following this, Mungo Jerry would have several more successes before interest waned in the mid-70’s. The band is still performing today, but has had an ever changing line-up throughout that time with Dorset being the only common factor. “In the Summertime” is one of those songs that just gets covered by artist after artists after artist; including versions by Derek Sherinian (with guests stars Billy Idol, Tony Franklin and Slash), Idle Rice and Shaggy. Below is the original video for “In the Summertime” as recorded in early 1970, and while the sound quality is not the best, it is worth it just to see Dorset’s incredible sideburns and stompy stomp left leg.